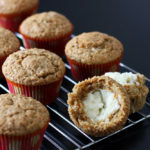 These carrot cake muffins are a delicious treat, perfect for an Easter breakfast or anytime you have extra carrots you’d like to use up! And with the cream cheese filling, you can’t go wrong. 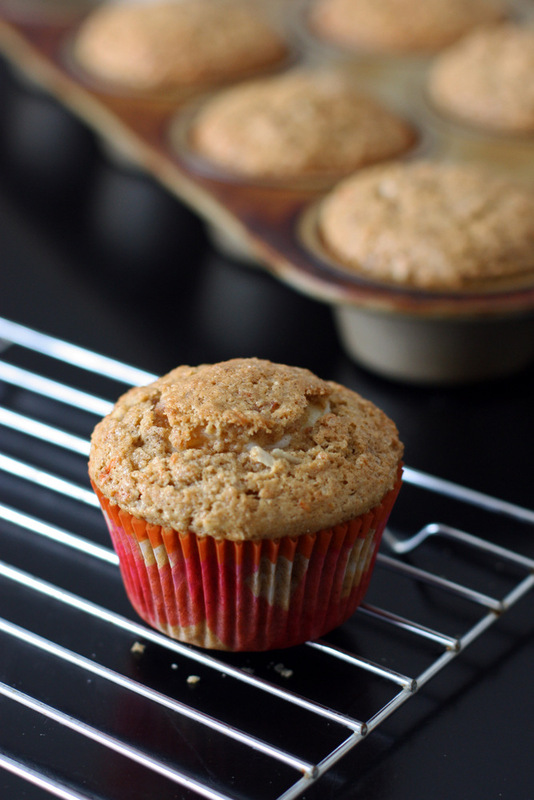 The first time I made these muffins, we lived in North Carolina. The morning was cold, but clear, and a friend and her two little boys came over for a playdate. There had been some snow warnings, so after she headed out, Bart fed the girls lunch while I ran to the grocery store to do my weekly shopping. As I was checking out, it started to snow. Hard. We lived just a few blocks from the grocery store (like. . . two blocks), so I had no trouble getting home, but within an hour everything was coated (you can see a photo of the view from my office windows that day). By early evening, our entire street was just one blanket of white. Duke was closed on both Thursday and Friday, and the snow just kept coming down. People were abandoning their cars in the middle of the road (it took my friend more than two hours to get home – usually a 30 minute drive), and we ended up staying home until Saturday, when the sun came out and the snow started melting quickly. It was Valentine’s Day weekend, but since basically the whole city was shut down, we didn’t even attempt to go out. Obviously, on such a snow weekend, you bake. And I made these carrot cake muffins I’ve been meaning to make for some two years, because I’m nothing if not prompt. It was so peaceful baking during quiet time and nap time, and even all these years later, I still remember that afternoon so fondly. 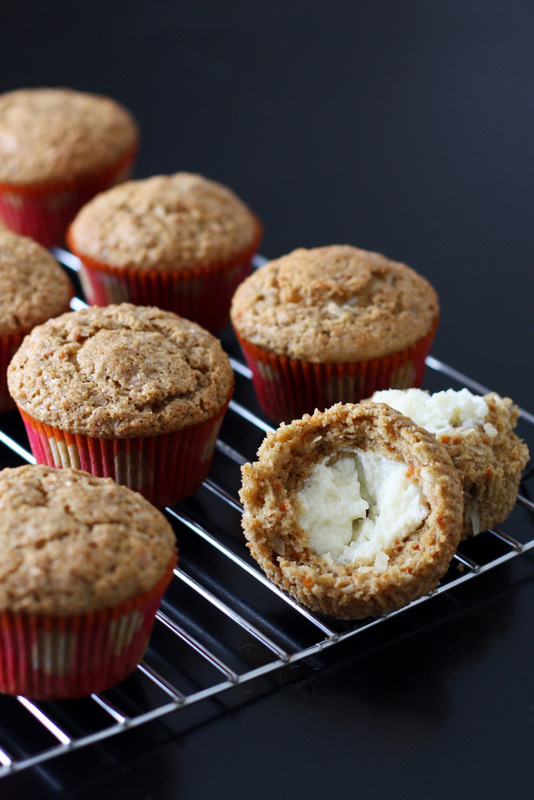 And these carrot cake muffins? A highlight of that weekend. I already enjoy carrot anything and filled with sweetened cream cheese? Sign me up for the next snow day (except don’t). Preheat the oven to 400 degrees. Line muffin tins with paper liners or grease. Set aside. In a small bowl, whisk together the cream cheese, granulated sugar, and vanilla extract until smooth. Set aside. In the bowl of a stand mixer, beat the eggs, water, oil, and vanilla together until smooth. Add the flour, both sugars, baking powder, soda, spices, and salt, and stir until just barely combined. Quickly fold in the carrots and coconut. Fill the muffin tins 1/3 full with batter, then divide the cream cheese filling between the muffins cups (try to keep it from touching the sides of the muffin tins. Then put an additional scoop of batter on top of the filling to cover the cream cheese. Tins should be about 3/4s full. Sprinkle with coarse sugar and bake for 22-25 minutes, until the tops are browned and spring back when you press gently on the top. Let cool for about 20 minutes before serving. Oooohhh yummm!!!! I totally agree…when you're snowed in, you bake! Isn't it insane how fast the snow came down?! I still can't get over it. Whoa nelly. These look so, so good! I made (tried to make) carrot cake sandwich cookies with cream cheese filling a few weeks ago, and they were such a disappointment. So my craving for carrot cake has gone unsatisfied (travesty!!!). I might just make these today! Thanks for sharing. I was looking for a "different flavour " cupcake recipe other than my usual vanilla or chocolate staple ones. They look delish. Will let you know how they turn out. Oh, these look so yummy. I've never made anything with coconut oil–just bought some, so these will be a great recipe to start with. Thanks for sharing! This sounds so over the top wonderful !!! My question is on the amount of carrots? available in so many sizes, so using 4 could be a lot or very little Can't wait to make these! oh good question. You're aiming for around 1 cup. These inside out muffins look so tasty. I do love a good muffin and carrot cake is my favourite so win win. I might try them this weekend. Made these yesterday! They were a hit with everyone at my house, thanks! How do these freeze? Having a big party and these look yummy! !